The Toronto Maple Leafs' first-round pick from 2012 Morgan Rielly lived up to the hype in the first game of the four-team rookie tournament in London, Ont., Thursday night. The six-foot, 205-pound defenceman was easily the best player on the ice for both teams using his speed and vision to make solid pro plays. Rielly, chosen fifth overall, used his lateral skating ability to quarterback the power play and produced three scoring chances of his own in the first period alone. He scored one goal in the shootout as the Maple Leafs edged the Chicago Blackhawks 3-2. Tyler Biggs, Toronto's first-round choice in 2011, scored the game-winning goal with Josh Leivo and Brad Ross adding goals in regulation. "He was as advertised," said Toronto Marlies coach Steve Spott, who handled the bench. "I put him in a tough spot in the shootout, but certain players want to in those situations and Morgan is one of those guys." Perhaps Rielly's most impressive skill was getting back into the play after joining the rush on offence. There was one time early in the second period when he seemed to be napping while heading back to grab a loose puck while on the power play and had it stripped away from him, but other than that miscue he played superbly. If Rielly was Toronto's best player, Leivo wasn't far behind - at least while he was in the game. He suffered a chest contusion and missed the third period. "It was more a precautionary thing to take him out of the game," Spott said. "If it was a regular-season game he would have been fine. We missed him in the third. He's big, he can skate and he has tremendous puck protection. "He's a player that when you need to create offence he can be that guy. In the third when we wanted to maintain pressure, we missed his presence on the ice." The slick-skating forward showed good speed and a nose for the net. That won't come as a surprise to anybody who watched him score 10 goals and 29 points in 29 games for the Kitchener Rangers last season after being acquired from the Sudbury Wolves. At 6-foot-2 and 180 pounds, Leivo is going to have to fill out, but his vision and quick hands suggest he'll eventually make it to the NHL. The Innisfil, Ont., native was the 86th overall pick by the Leafs in 2011. The Leafs' coaching staff has challenged rookie defenceman Stuart Percy to separate himself from the pack. 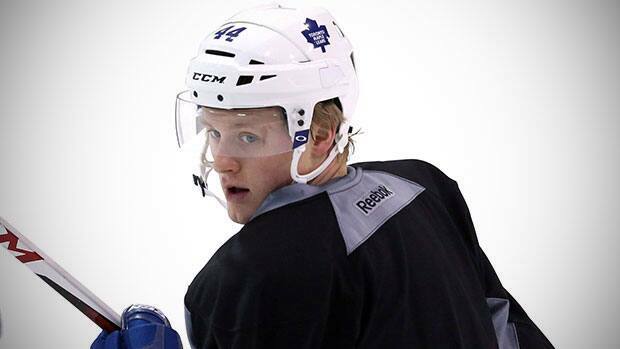 A first-round selection in 2011 (25th overall), Percy is a steady performer, but the Leafs want more from him. "He has to stand out from the other players," said Spott. "He is a very skilled player, but he has to show that skill on a consistent basis." Percy scored 13 goals and 45 points in 68 games with the OHL's Mississauga Steelheads last season and added a goal and three points in four regular-season games with the Marlies. He played a very solid game against the Blackhawks rookies, but didn't stand out. Then again, playing a mistake-free game as Percy did Thursday isn't all bad, is it? Chicago's Maxim Shalunov received two minutes for unsportsmanlike conduct in the second period when he stood in front of Leafs goalie Garret Sparks and screened him like Sean Avery did Martin Brodeur a few years ago. If you want to make Spott smile, just mention the name Andrew MacWilliam. "Oh boy, he's big, strong and powerful," the Marlies coach said. "He's going to be one of our alternate captains and he's a guy who is full of character. He's probably going to catch somebody early with their head down in this tournament. "He's just a big, strong man that has an edge. He's going to relish the physicality. I don't think a lot of people know him so he's going to open some eyes here this week." MacWilliam was a physical force in Toronto's game against Chicago rookies Thursday night. He lambasted Chicago's Chris DeSousa late in the second period with the hardest check of the game. DeSousa left the contest. MacWilliam, 23, scored two goals and 13 points in 41 games with North Dakota last season to go with a team-high 116 penalty minutes. It is his penalty total - 327 minutes in four seasons - that is the best indicator of what to expect from the six-foot-two, 230-pound Calgary, Alta., native. In the previous two seasons with the Camrose Kodiaks of the Alberta Junior Hockey League, MacWilliam totalled 350 PIM in 111 games. You get the picture. "He's a predator out there," said Toronto's director of scouting Dave Morrison. "He hurts people with Scott Stevens-like hits." MacWilliam knows he will have to be physical in the rookie tournament to make a positive impression. "I'm going to come in and show people what I can do," MacWilliam said. "My physicality is something I have to bring every day. It's a skillset of mine and if I don't bring it I'll be disappointing people. I have to make sure I focus on that along with the rest of my game." MacWilliam, who got a small taste of professional hockey last season when he joined the Toronto Marlies for two games after his WCHA career concluded, said he felt a little targeted by the referees last season. Fighting draws an automatic ejection in NCAA hockey and his hard-hitting game was not always appreciated by the officials. "I don't know if it's NCAA hockey or just hockey in general, but they seem to be cracking down on big hits and hockey is a fast game so I was on the short end of the stick with a few calls against me in my final year," MacWilliam said. "They can't really change the way I play, though." Drafted 188th overall by the Maple Leafs in 2008, MacWilliam knows pro fighting will be part of his repertoire. The business management major in university knows he`ll be expected to give opponents the business this season. "It's something I'm going to have to bring," he said. "I had to do it a little bit in junior in Camrose and I guess it comes with the territory. If you're going to play a physical game, guys are going to want to come after you so I have to be prepared for it."